A global index on access to medicine has found that the majority of the medicines needed by the world’s poor are developed by only five companies, and that these medicines are focused primarily on just five diseases. The group behind the index calls on more pharmaceutical companies to join efforts for increased access and to expand the list of medicines, in order to build resilience in treating diseases that affect the poor. The 2018 Access to Medicine Index, published today by the Access to Medicine Foundation, shows that the top five companies develop the majority of the medicines to treat diseases that affect the poor, and that half of all such activity is clustered around five diseases: HIV/AIDS, tuberculosis, malaria, Chagas disease and leishmaniasis, according to a press release. According to the 2018 index, as compared to the previous 2016 index, GlaxoSmithKline (GSK) has retained the first position. Novartis moved from third to second, switching places with Johnson & Johnson. Meanwhile, Merck KGaA stayed in the fourth position, while Takeda jumped ten positions from fifteenth to fifth. The full rankings from the index are included below. 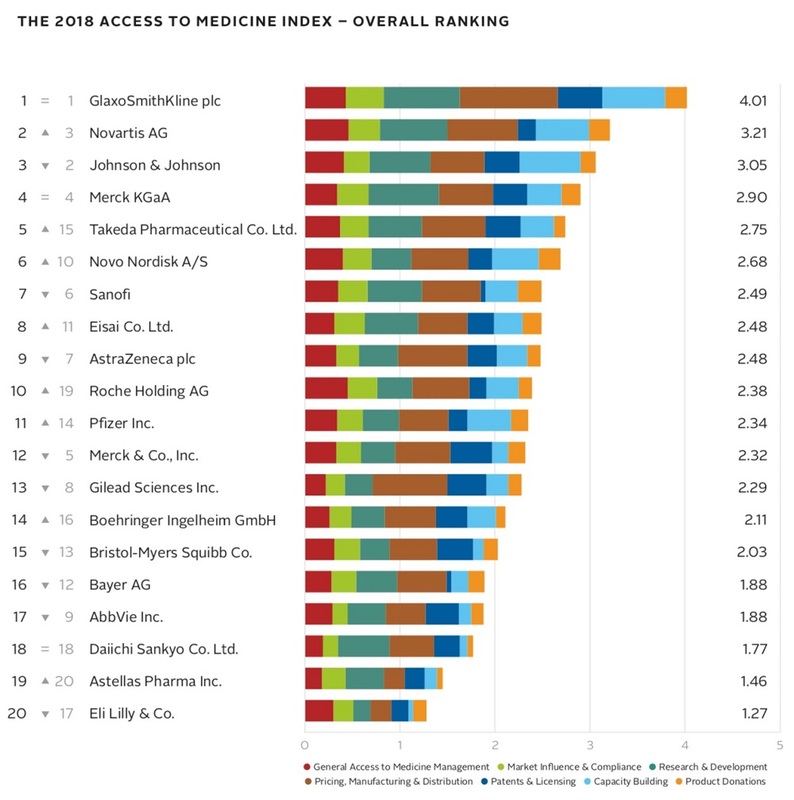 The Access to Medicine Index analyses the 20 largest research-based pharmaceutical companies that develop medicines to treat high burden diseases in low and middle income countries, according to the release. The index is published every two years by the Access to Medicine Foundation, which also publishes an index on access to vaccines. More information on the foundation can be found here. The index found a trend that companies engaging in activities to further access to medicine are concentrated in small groups. This R&D, the index found, is focused on a select group of five diseases, HIV/AIDS, tuberculosis, malaria, Chagas disease and leishmaniasis, all of which “are the target of global health initiatives and have international donors behind them,” according to the release. The index also found this company concentration trend in other activities important for access to medicine, such as “small groups of companies account for the increases in fairer pricing strategies, and in access planning while products are still in the pipeline,” the release said. Progress since 2016 has shown that overall, “the industry continues to mature in its approach to access to medicine,” according to the release. The index found greater transparency by companies “about where they have patents in force, which is valuable information for international medicines procurers,” and it found that “companies have more projects in the pipeline that target global health priorities than they did two years ago,” it said. It found that companies are “scaling up commercial models that explicitly view people living in underserved communities as customers” and are applying “strategies that set different prices for different segments of a country’s population [to] continue to become more sensitive to what people can afford,” the release explained. Further, most of the access programs are focused on communicable diseases, while access programs for drugs that treat noncommunicable diseases, such as cancer, are critically important for low and middle income countries, where “approximately 65% of cancer deaths now occur,” according to the release.